On Sunday, April 28th, you are invited to spend the day shopping for a cause at a beautiful private estate in Rancho Santa Fe! 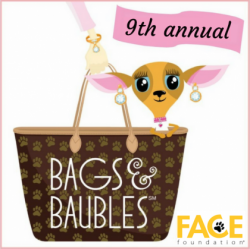 FACE’s 9th Annual Bags & Baubles silent auction will feature a gorgeous collection of new and “gently loved” designer handbags, vegan handbags, jewelry, accessories, sunglasses, and men’s items. In addition to the great shopping at Bags & Baubles, guests will be treated to wine, gourmet appetizers, and delicious desserts. There will also be 10+ luxe opportunity drawing prizes!